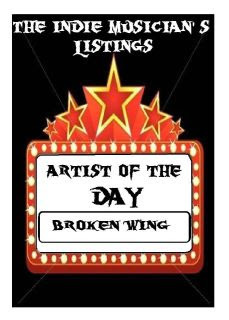 KBM Management (Promotion Page): Broken Wing - Band of the Day ! This “Rock 'n Roll Tribe” founded by Mike Harvey, an American songwriter with Sioux heritage, delivers always and only original content. Performances showcase the strong lead vocals of accomplished Canadian musician, producer and co-founding member Scott Young. Two albums titled Dreamcatcher and The Awakening, have been recorded and are now in final production stages at Alchemy Sound Studios. Each collection of genre diverse songs chronicles a unique rock ‘n roll odyssey. Screenplay development is also underway for these projects. Four BROKEN WING™ singles are now available worldwide at iTunes® stores. Classic rock describes Dreamcatcher, Marooned and the “bluesy” Darkest Before the Dawn. Southern fried single Rock the World is currently the most popular from this distinctly North American band. 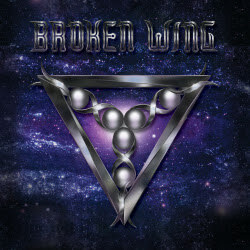 Thank you for your interest in BROKEN WING . "Just a fantastic sound, and overall professional production!! Stream their music and enjoy the sounds, and the visions of some seasoned pros!!! \m/"